Picture 1. The plug-in dialog (Mac OS version). The legends on untitled buttons are displayed when the mouse moves over them. Scan a small colour image (about 1 x 1 inches) at 600...1200 pixels/inch. It is important to use the scan resolution from the scanner presets value. 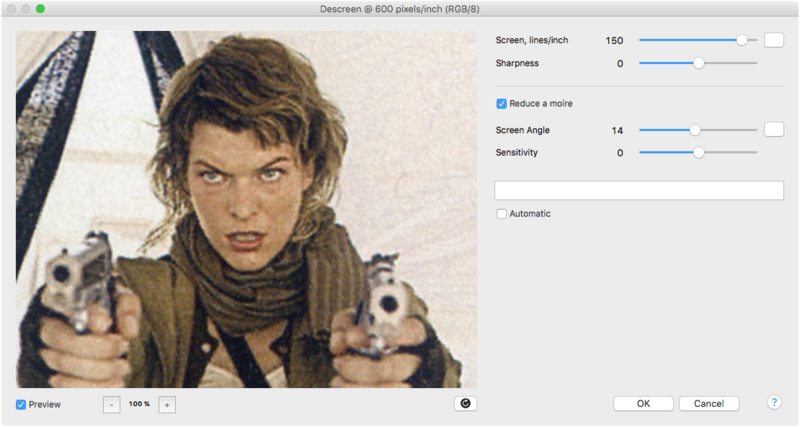 If your scanner has Descreen or Sharpen options, disable them. The image should be scanned without scaling (i.e. 100% scaling). If you save the scanned image before descreening, use the TIFF or PNG format rather than JPEG. If using JPEG, choose the best quality setting or minimal compression. To remove the screen, you have to specify screen frequency on the Screen slider (see Picture 1). An example of screen removal is shown in Picture 2. Usually the plug-in calculates screen frequency automatically, but if an image has no distinct screen, it fails to do so. You may specify the screen frequency manually by the Screen slider. If you enter screen frequency higher than its actual value, the screen will be reduced but not removed completely; if lower, the image will lose sharpness. Left: the scanned image (included in DescreenSamples.zip). Picture 3. 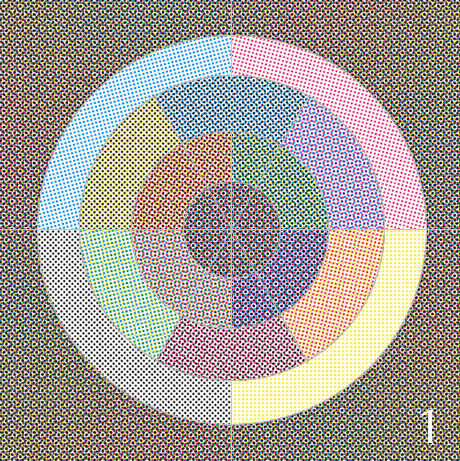 Reducing the halftone moiré pattern for a colour image. 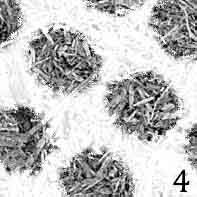 It is possible that during moiré reducing the moiré pattern becomes more prominent. 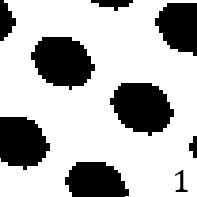 This phenomenon is called "false moiré" in this guide. The false moiré usually appears near "problem areas" such as sharp details of the image or lines parallel to screen lines. An example of a "problem area" is text placed over a photograph. To eliminate the false moiré reduce the Sensitivity. If you save the scanned image before descreening, use the TIFF or PNG format rather than JPEG. If you have to use JPEG, choose the highest quality settings (the minimal compression rate). Alternatively, use any file format that offers lossless compression. Place a sheet of glass over a sheet original to make it perfectly flat; put enough weight on the back of books and magazines. This is especially important for CIS scanners. Their depth of field is greatly limited compared to CCD scanners. Put a black paper behind the sheet you are going to scan. This prevents the back image from penetrating to the scanned one. Adjust black and white points in the scanner that the paper becomes nearly white and the black due becomes nearly black. A good scanner should be able to scan an A4 original at 600 pixels/inch without any pause. If the scanner makes pauses during scanning, it slices the scanned image. The less precise the scanner's mechanism, the less the slicing accuracy. Seams and gaps affect the descreening quality. Sometimes it is possible to see the seams and gaps in Photoshop at 100% magnification. If it is the case, scan the images one by one instead of scanning many images for one big scan. Most of fax-machines, copiers and multi-function devices do not provide good quality when they scan at 600 pixels/inch or more. They usually apply their own sharpen and descreen filters by default. This interferes with the Descreen plug-in. If you have troubles with descreening, download properly scanned images from the plug-in site. Try to descreen these image to see how the plug-in should work. Also you may scan the image using another scanner. Adobe Photoshop 32-bit or 64-bit (CS4-CC2019). A good scanner with the optical resolution at least 600 dpi is required. Fax machines and multi-function devices usually do not provide good enough quality when scanning at 600 dpi or more. Download the recent plug-in version here.